I don’t know about you, but my storage areas were seriously lacking in organization or neatness in this house. Usually, about 6 months in to a house, I go through and put up hooks, baskets, buckets, buy lg storage Tupperware, etc so the spaces look decent and can be used. That 6 months is quickly coming to a close and my storage areas could use some serious help. My garage is my pantry, garden shed, school supply closet, and camping/travel equipment storage area. It has a lot of jobs and needs a lot of help to stay nice and organized. A bit on shovels and other hard to store things: I have a large 5 gl bucket that I fill with one bag of playground sand that I keep my often used garden shovels in. The sand keeps them dry and sharp, and as long as you have it up next to a wall, it is a stable way to keep your most used shovels. If you don't have a wall to put them next to, a large tomato cage would do the job well and keep them standing up and out of the way. The other shovels, along with my apple picker, tree trimmer, rakes, hoe, and picks, all hang on the garden shed/garage wall. I have used many different tools to make this work, but my favorite is strategically set nails strait into the studs. For this house, however, I am planning on using one of those broom holders that fits onto the studs and holds a variety of things with only two screw holes. I will have one inside the house for brooms, wipe rags, mops and plastic bags, etc. 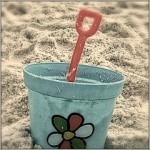 The other will be in the garage, holding all of those things that don’t go into my bucket of sand. Axes and other sharp things that could fall on you while you are working in the shed should be as securely attached to the wall as possible. In the last shed, I just simply used two nails, securely put into the studs, with the ax on it, and then wrapped a rubber band round the nails so the ax didn’t move unless I wanted it to. This worked really well. 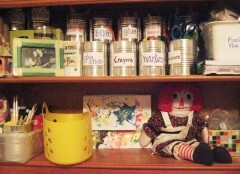 Another Quirky Momma family recently re-did the storage of her party/kid craft supplies using old formula containers. The formula tins are great for storing things, unlike most cans, the edges are child-friendly and not sharp (or at least the cans she has). They are also stack-able. Great for all those little knickknacks that make up your kids-craft supplies. Maybe you can adapt this for your home. And if you don’t happen to have a ton of tins lying around, Organize.com has several in a variety of colors. This is part of our De-Clutter Challenge! Feel Free to join us as we organize our homes! Previous Post: « Milk and Cuddles goes to NASCAR!! I am all about this right now. I have been mad woman cleaning out closets and drawers. I must learn to let go of things and put them in their proper place. Me too! We are trying to fill up a garbage can with stuff to throw away and a trash bag of things to take to the Goodwill over the next day or two! Gotta clean out the house before the holiday clutter! Dear Administrator, I noticed few problems while viewing this site. Make sure you solve all of them now. to be interested except it is one thing to do with Woman gaga!